Sand dunes provide natural coastal protection against storm surge and high waves, preventing or reducing coastal flooding and structural damage, as well as providing important ecological habitat. They also act as sand storage areas, supplying sand to eroded beaches. Preserving or enhancing dune systems can help protect coastal property, especially in areas with low or moderate erosion. However, dunes do not provide protection from seasonal beach fluctuations, long-term erosion or inlet migration – no matter how large the dune. Sand dunes are dynamic features so the movement of the landform must be considered for all dune preservation, enhancement, and reconstruction activities. 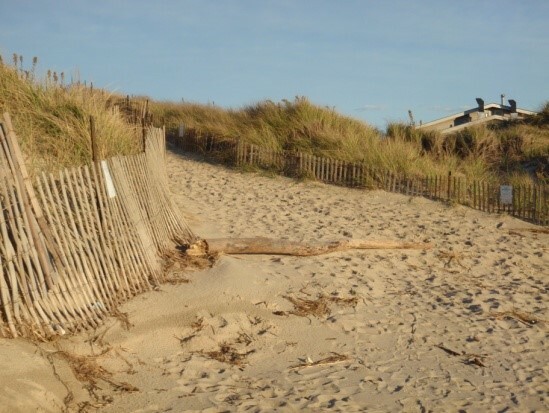 For areas with existing dunes and low erosion rates, simply preserving dunes might be all that is needed to help maintain protection from storms. Other options include planting beach grass, erecting fencing, building dune paths and walkovers to prevent trampling of the dunes in multiple areas. See CT Beaches and Dunes for more information and resources. •	Fencing, while a low cost option, can be easily destroyed in a storm event. •	Fencing may restrict bird or turtle habitat. •	Fencing should be installed landward of the high tide line. •	There are different patterns of installation to consider depending on beach orientation and wind patterns. Contact state and local officials before installation of any fence type on the dunes.